Slade Point Reserve lies at Lamberts Beach, stretching 73 hectares and conserving one of the last remaining areas of coastal dunes and paperbark wetlands in the Mackay region. Visitors can walk through the reserve. 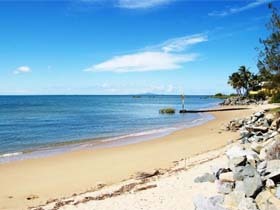 Lamberts Beach and Slade Point, on the other side of McReady's Creek are often favourite haunts for mackerel and reef fish.